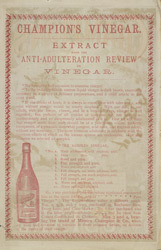 This is the reverse of the advert and features Champion's Vinegar. Mustard has been a popular condiment in Britain for hundreds of years. It has been suggested that the Romans introduced one type and that it was ground and sprinkled on food like salt and pepper. It is a Mrs Clements from Durham that is credited with discovering the type of mustard that we know today. In the 1700s she travelled around the country selling her product. Travelling mustard salesmen were common in the early 19th century as condements were purchased on a daily basis because they could not be refrigerated. People could also take their pots to a specialist shop to be filled. Brand's like 'Champion's' were some of the first to mass produce mustard.